City of Bristol continued their golden start to the Swim England Synchronised Swimming National Championships as Daniella Lloyd and Greta Hampson landed the Duet Tech title. Hampson had already topped the podium in the opening event, impressing to win Tech Solo gold by seven points. She and Lloyd won the Tech Duet crown by a similar margin, edging past the 70 mark to score 70.0634. The result was made more impressive by the fact that the pair are a relatively new partnership, coming together for the first time to win 15-18 Years Duet gold at last year’s National Age Group Championships. Both swimmers were part of the British team who finished sixth at March’s World Series event in France. City of Leeds’ Daisy Rushton and Millicent Costello were next best, narrowly finishing ahead of City of Birmingham’s Melanie Whitburn and Phoebe Bradley-Smith. The Leeds pair scored 63.8505, handing Costello her second medal of the day to go with her Tech Solo bronze. Whitburn and Bradley-Smith received 62.2430 for their routine to claim the third spot on the podium. 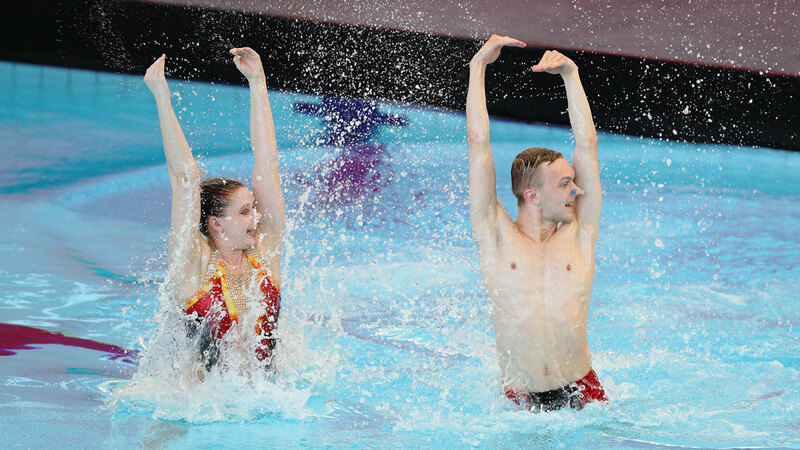 City of Leeds’ claimed their first title of the weekend as Connor Hill and Rosie Barrington competed in the Mixed Tech Duet. Hill and Barrington are the first mixed pair to compete at the senior national stage in England, and scored 49.8673 for their tech routine.